Sticker Pack by Angel Hawari. These stickers are made with high quality white 3.4mil Vinyl rated to last up to 5 years outdoors, along with a 2.5mil Glossy UV Laminate to further extend the life of the stickers by offering protection against light scratches and fading. And Eco-Solvent inks produce vibrant stickers that pop! Making really high-quality vinyl stickers that will hold up to the elements has been on my to do list for too long! But they're here now, and I am super proud of these guys. 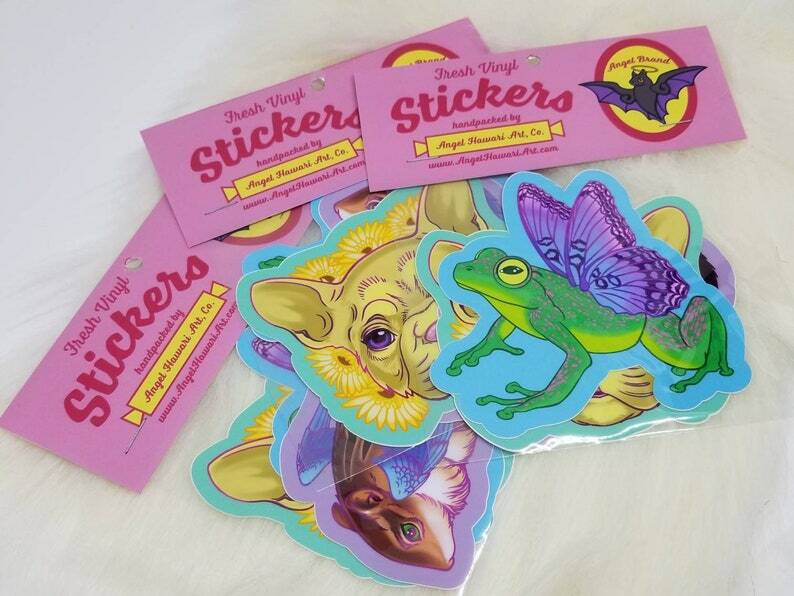 This sweet little frenchie, fairy frog, and angel chipmunk are a super sweet vinyl stickers you can slap on notebooks, laptops or where ever else you want. These durable stickers will resist the ravages of sun, wind and rain with panache and aplomb. I hope you enjoy them as much as I do. Sweet Little Frenchie, Fairy Frog, and Angel Chipmunk © Angel Hawari, 2019. All rights reserved. Permission must be granted to copy all or part of the art work. This artwork may not be sold, duplicated on other websites, incorporated in commercial products, or used for promotional purposes in any manner without my express written permission. Cutest pin. Looks amazing in my menagerie. Quick shipping, well packaged and adorable. Thank you! I accept Paypal, credit/debit cards & Etsy gift cards for secure payment processing. I am happy to make arrangements for returns and exchanges. Please message me directly, and I will get back to you as soon as I can. If your order arrives damaged, please send me pictures right away and I will take care of you. That could mean a refund, or replacement item, but please get in touch as soon as you are able. I want you to be 100% happy with your new art. If there is ever any issue with your order, please reach out before leaving a review. I love art so much I really want art collecting to be a wonderful experience for everyone. And there's never been an issue I couldn't mend so all parties are happy. All orders are shipped through the USPS First Class, or First Class Int'l. **Domestic US orders usually take 3-5 days for delivery. **International orders take about 10-16 days to arrive. Please note: Delivery times can vary, but these are the average delivery times I've noticed.